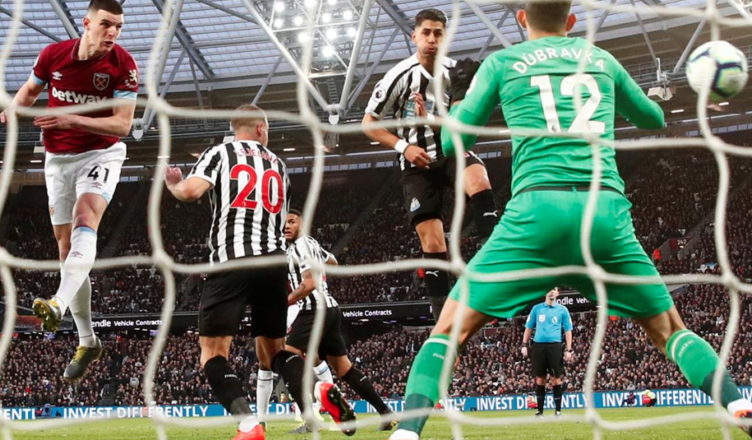 West Ham 2-0 Newcastle: Reality check as toothless Toon get complacent – NUFC blog – Newcastle United blog – NUFC Fixtures, News and Forum. A frustrating display from the lads today, with us looking a little laboured and lacking the intensity that has seen us pick up so many points over the last few months. Thankfully, results earlier in the day mean we are still 6 points (7 points when factoring in goal difference!) ahead of third bottom side Cardiff – so while today’s result wasn’t hugely costly in our bid to stay up, it was a big chance missed to extend the gap and really consolidate our Premier League status. Rafa insisted before the game that we weren’t safe and mustn’t allow complacency to creep in – and it’s fair to say it did here. We rely on being ‘at it’, and we weren’t today – it’s as simple as that. We didn’t give West Ham a great deal of chances, but we were just a little too sloppy at both ends, with Schar failing to track Rice’s run and Lejeune’s unnecessary lunge leading to two first half goals that could’ve easily been avoided. That said, we didn’t create enough at the other end, with us failing to test Fabianski over the first 45 minutes. We came into it a little in the second half, with us finally getting the odd good ball into Rondon, but it just wasn’t to be today, with the odd error at the back and a lack of penetration or final ball up top costing us against a decent West Ham side. Almiron was quiet in the first half but carried the ball well in the second, Perez was heavily involved but often flattered to deceive or lost possession, while Ritchie frustrated, with a few too many of his crosses being poorly weighted. Uncharacteristic errors from Lejeune and Schar cost us, while it was also a worry to see Longstaff taken off at half time – with it since emerging that he’s left the London Stadium on crutches. Elsewhere, Cardiff were beaten comfortably by Wolves, Palace won 3-1 at Burnley, Brighton snuck past Huddersfield and Southampton lost 3-2 at Old Trafford despite taking an early lead. Today was a reminder that we’ll get beaten if we’re just 10 or 20% below the level expected. As comfortable as our league position may look, we aren’t safe yet and must not get complacent. Let’s not overreact, let’s just hope we’re much better next time out. PLAYER RATINGS: West Ham 2-0 Newcastle – One impressive 7, but far too many 5’s & 6’s..
Olly, we were sluggish and outplayed, that’s it. As has been said reality check, still lots to do yet. Ice, from last thread, poor you, vertigo is a terrible thing to suffer from. you getting good meds for it i hope. I thought 2-0 was fair. West Ham have a better team than us and their odorous owners have actually seen through with their commitment to invest, especially this year where their net spend was 90 million pounds more than NUFC (was a fact the commentator here mentioned). With a free stadium they can afford to do that. I think the council had a claw back of some money if the owners sold within 5 years and that amount declined as time went by. But with Spurs spending 1 billion on their ground then Sullivan and Gold can afford to play the long game and fund their manager to have at least an upper mid-table team. Then they’ll sell and get 1 billion pounds, partly because it is London which probably doubles a clubs value. That’s the bottom line. West Ham have given a good manager the funds to be an upper mid-table team whereas Ashley has given a good manager the funds to be a relegation team. Unfortunately that was shown on the pitch today when we didn’t punch above our weight. Hopefully this will stop us getting ahead of ourselves and stop any talk of us not needing some of our quality players because the incumbents are doing so well. I thought Diame looked very good after his injury layoff. Dummett was out longer and looked rusty. Hopefully Longstaff will be OK but I would play Ki anyway as Longstaff was getting so much attention I think he may have needed a pause to refresh in any case. I would definitely have Jonjo on the bench. Mainly because he has been out for so long. Like 3 months but he was carrying the injury before that and came back early before going out again. There is no way he is ready for 90 minutes. I will be critical AGAIN of some of my fellow NUFC fans. I stress not on here. They always seem so shortsighted. Hayden and Longstaff have a few good games and suddenly we don’t need the other players who have also done well for us – Shelvey, Diame and Ki. Hayden had a quiet game and Longstaff picked up an injury showing once again that it is a squad game. I will also say that both were for the most part new to other managers as well so Pelligrini had some time to get in the video room, get his coaches together and gameplan for them as well as the 3 centre back system. It helps that he has much better players than Huddersfield and Burnley. For anyone complaining about Lejeune today I have 4 words for you: Mike Williamson, Steven Taylor. Kim sluggish sums it up perfectly for me. I had vertigo on and off over the last three years but it got quite bad last year with me having it every day. Got fed up with it and went to my doctor and she made me an appointment at E N T at the Freeman Hospital. They did the epley maneuver on me and told me that should stop it. It did help but did not completely stop the vertigo so they did it again six weeks later and this time it did stop and I have not had it since. The biggest difference for me yesterday was the quality in the final third. They started with Hernandez, Lanzini and Anderson – and had Arnie, Nasri and Antonio on the bench. We are miles away in that respect. They had made 5 changes to their team yesterday – fresh legs. You could see we looked laboured. I didn’t expect anything from yesterday to be honest, coz we always seem to struggle in London. I think 2 more wins could be enough to stay up, and we have games coming up that I think could get us those points – but do we rest players in games we are unlikely to get the win??. It did help but did not completely stop the vertigo so they did it again six weeks later and this time it did stop andI have not had it since. That was undoubtedly our worst performance for a long time. Two poor goals conceded, we just weren’t at the races. I didn’t see Almiron get a decent pass all game. Very odd when things persistently weren’t working down the right. All in all a poor day in London. Can’t win them all. Hope young Sean is OK. Rafa seems to think so but it is worrying to see him to crutches. Hope Rafa doesn’t see this as a sign to leave the lad out because he’s been outstanding. Poch to Madrid. Rafa to Spurs. I am telling you those Madrid fans are tw@ts. Booed Bale again yesterday. He won them at least 1 Champions League final and if had done that overhead kick for us even in a League Cup final he would have been immortal. Their manager is a dead man walking (is his name Solari, can’t remember they go through so many). Mentioned this before but I was at a game 2 years ago and the booed Ronaldo FFS. Zidane was manager and they were CL holders. So the club is no longer for sale, unless someone offers Ashley’s asking price – hasn’t that always been the case?!?!!! – so nothing has actually changed. Ashley has never been the most active seller, and there has never been the negotiating that goes with a sale – his stance has always been ‘this is what I want, pay it or pi$$ off’. I think the main change is that the profits over the last few seasons have paid off the debits to Ashley and now, any players bought will be bank loans – as was the case with Almiron – and is the case with most (if not all) other clubs. Amazing how managers often take a striker and play him on the wing. Pardew moved Cisse oto the wing and in my view ruined him. Hence the saying “Pardewed “ Armstrong at Blackburn moved to the wing – not scoring much now And the latest one is Gayle at West Brom. Fans are up in arms with him being moved to the wing. It is not always true but I believe in horses for courses. I would prefer to see a player on the bench rather than played out of position. Mitro is looking more and more like an enforcer for the Russian Mob. I expect he will have prison star tattoos on his knees by the end of this season. Rafa to Spurs Stuart, mate! Why don’t the current Scousers sound like The Beatles? They all sound so high pitched and wanting to have something come out of their throat. If The Beatles sounded like Jamie Carragher I think the history of music as we know it would be different. Obviously the scouse derby was going on when I was saying that. it’s a shi t hole mate, last place on earth i would live. Ice – if that’s true I hope they leave him out and fix him up properly. He’s done an amazing job while the more senior players were out but they are all back now. I would hate for him to do damage to himself now that troubles him for the rest of his career. Sharpy17: Ice – if that’s true I hope they leave him out and fix him up properly. Ice: when they do the scan they usually know that it is bad and just want to know how bad. I bloody well knew they shouldn’t have compared him to Carrick. He was a bit of a sicknote. Poor Sean, hope it’s not too bad. RIP Keith Flint, another lost soul takes his own life. 🙁 Why oh why don’t lads talk about their mental health issues. The fat of the land is one of my all time favourite albums. The Chronic quote The Sun and say that NUFC’s “fifth choice” midfielder will be off to West Ham in the summer. OK, I always believe The Sun. But, Rafa did revert to 4 at the back on Saturday so Shelvey might be needed. And who is he behind? I think we will be seeing Jonjo before too long and The Chronic might want to watch who they quote. But Mark Douglas will be on soon and say it weren’t them that done it Mr., it were someone else that broke your window, a lad from another street. Oh, and can we have our ball back Mr.
At the risk of contradicting myself I would have Ki and Diame on before Shelvey if we play with 5 at the back. Lejeune and Schar can bring the ball out and play it long, and we need more mobility in midfield in that system. 4 at the back and Jonjo would probably be 1st or 2nd choice. Remember, we haven’t seen him with Almiron yet and instead of knocking the lad I am excited to see how they do together. Not sure that Longstaff seeing a “specialist” means anything. Wouldn’t that be routine after a scan? Keeping my fingers crossed as he looks a talent. If it comes back then go to your doctor and ask to have it done by your local hospital E N T dept. I thought they had stopped my vertigo the first time I went last September , but on my follow up appointment six weeks later they managed to induce the vertigo again and said the crystals in the left side of my head were still not in place . They did the procedure again to specifically realign those crystals. They gave me another follow up appointment, again six weeks later , and this time they could not induce the vertigo and said I should not get it again. The first domino has fallen in Rafa’s trip to Spurs. Solari is toast and Madrid’s options are extremely limited as shown by their last 2 appointments. Maybe they will give it to the Ajax manager Ten Hag but most likely Poch. Then Spurs might go for Ten Hag but Levy will want to steady the ship with the new stadium to pay for. I think Rafa is the obvious choice. Spurs are not automatic top 6 as everyone seems to assume. Before Poch they had Tim Sherwood FFS. Kane was out on loan or recently returned and they had wasted the money they got for Bale. They have made some lucky or astute signings since depending on your point of view. They have to win something next year otherwise Kane and Alli will be off. Nobody turns down the Real Madrid job no matter how poisoned a chalice it is, so Poch is as good as gone. Enter Rafa? Eric, yeah Rafa to Spurs, I can see that. Ice, so glad you have gotten on top of that vertigo mate, you too Sidekick. I don’t see Rafa at any of the top 6 clubs – that’s not to say he hasn’t got the ability to be, I just don’t think he fits what they are looking for now. They want young, recently retired footballers with forward thinking tactics. They want a brand of football now – the Pep brand, the Klopp brand. Older managers are a thing of the past and the likes of Rafa, and I think maybe Jose now wouldn’t be considered for those top 6 jobs – maybe interim, but not long term. If Poch leaves Spurs I think Eddie Howe would be the most likely replacement. I think Rafa stays at NUFC. They want young, recently retired footballers with forward thinking tactics.They want a brand of football now – the Pep brand, the Klopp brand.Older managers are a thing of the past and the likes of Rafa, and I think maybe Jose now wouldn’t be considered for those top 6 jobs – maybe interim, but not long term. I don’t agree because Levy has a stadium to pay for and they haven’t won anything in ages. They have the team to win something. They don’t have the money for new players though and Rafa excels in working with what he has. Its a bit of a dilemma for Saturday. I would start Diame and Ki. Hayden hasn’t done anything wrong but him and Diame together is just too defensive. Diame was the best player on the pitch against West Ham which is why I would go with him over Hayden as he seems fully recovered and only lost his place through injury. Would definitely have Jonjo on the bench. Is that too many midfielders? Then leave Joselu out FFS. I don’t like to slag NUFC players off but he is rubbish. Him and Amdy Faye are exceptions to my rule of not slagging NUFC players off. Actually, Snodgrass was the best player on the pitch at West Ham but Mo wasn’t far behind. Eric Sykes: I don’t agree because Levy has a stadium to pay for and they haven’t won anything in ages. They have the team to win something. They don’t have the money for new players though and Rafa excels in working with what he has. Eric – I don’t see Poch leaving Spurs actually. He has the safest job of the top 6 sides – he has that project that Rafa refers to at NUFC. His remit will be similar the Wengers when they got their new stadium – compete for trophies – but top 4 is essential for the money it will bring into the club. Their main top players have all signed new contracts recently and they have some very talented young players coming through the ranks. I would be amazed if his head was turned by a trigger happy Real Madrid, knowing that it’s highly unlikely he’d be there beyond 2-3 seasons. I saw a rumour that Madrid are ready to offer Bale plus £20m for Eriksen – if true I’d take their hand off. But the one thing that is certain is Levy plays hard ball in the transfer market, and always seems to be right by the club. While he and Poch have a good relationship, I don’t see Poch going anywhere. Sharpy17: Eric – I don’t see Poch leaving Spurs actually.He has the safest job of the top 6 sides – he has that project that Rafa refers to at NUFC.His remit will be similar the Wengers when they got their new stadium – compete for trophies – but top 4 is essential for the money it will bring into the club.Their main top players have all signed new contracts recently and they have some very talented young players coming through the ranks. I saw a rumour that Madrid are ready to offer Bale plus £20m for Eriksen – if true I’d take their hand off.But the one thing that is certain is Levy plays hard ball in the transfer market, and always seems to be right by the club.While he and Poch have a good relationship, I don’t see Poch going anywhere. Totally disagree Sharpy mate. Nobody turns down Real Madrid. Levy’s track record before Pochetinno was Sherwood and Vilas Boas. They got lucky and luck doesn’t continue forever. I think it is a certainty now that Poch goes to Madrid. The other part of my theory of Rafa to Spurs is about 50-50. Eric – Poch was nailed on for the Man Utd job 4 weeks ago mate. I think he stays at Spurs, god knows who for Madrid but I don’t see it as appealing as it once was mate – we shall see though. I don’t think Rafa or Poch are going anywhere. Mixed news on Longstaff. We’ll see what the specialist says but it sounds like he doesn’t need an operation. georgio: I am not usually wrong on my predictions. I predicted NUFC 2 West Ham 1 last weekend. I was right about Rooney and Wilshere though. But that was shooting fish in a barrel. They deserve each other if that’s the case. The Madrid fans are the most fans are the most fickle fckers on earth and a Jose failure in his second coming will serve them right. Eric Sykes: They deserve each other if that’s the case. The Madrid fans are the most fans are the most fickle fckers on earth and a Jose failure in his second coming will serve them right. Ice: I just can’t understand the Madrid fans. Haven’t they won like 3 Champions Leagues in a row. If I remember right Bale came on and got the tying goal against their cross town rivals 2 years ago and they went on to win. I mean, that is like Shearer coming on and winning the FA Cup against Sunderland. Then he scores that overhead kick last year. The best goal in the history of Champions League finals. AND THEY BOO HIM NOW. That was some result for ManU last night. Good old VAR! Real Pity about Longstaff. He was a very rare bright light in another dull season. Hope it doesn’t have any long term consequences. It shouldn’t – just look at Lejeune who had a worse injury. Mind you he had a stinker at WestHam. Oh well it was nice being optimistic for a couple of weeks, gotta feel for the lad, gets his big break, then this. I watched it. Isco not in the team. A new manager would have funds for new players by selling Isco and Bale. Plus Messi cannot go on forever so within a couple of years Real Madrid can win La Liga. 4 out of the last 5 Champions Leagues means they did something right. Should be fun on Saturday. The crowd will have the Mouthy Mackem to jeer. You have to admit he is a bit c@cky, berating his teammates but making his fair share of mistakes. And he’s a Mackem. The crowd can go after him for the full 90 minutes as he’s right in front of them. I expect a reaction from Pickford probably some swearing or a hand gesture. Obviously, it should be done in good humour by the crowd, no coin or bottle tossing. Sharpy: on Ajax. The commentator said the entire budget of Ajax’s 1st team, reserves and youth team is equivalent to Gareth Bale’s annual wage. Apparently got the information from Overmars. Shows you a few things. Investment in an academy is not always a waste of money. There are still some bargains out there to be had. As you mentioned Tadic played well and can’t be on THAT much if the statement about Bale’s wages is true. I doubt there will be any bargains from Ajax as they have made the grade now and have been scouted by everybody. Maybe steal someone from their youth system. A lot of teams seem to do that. Off the top of my head I can think of Pogba, Sancho, Fabregas and Solanke. We even did it years ago with Olivier Bernard. And Ashley started out that way but then stopped, probably because he didn’t want to upgrade the facilities. Actually we have a couple. There’s Sorenson and that Spanish lad. Fernandez or something like that. City and Chelsea have stockpiled the young players but it looks like a few are getting disillusioned with no path to the first team. If they need a player they just go out and buy one. Foden is blocked by the Silvas but I think he will see more playing time as David gets older. Even Loftus Cheek hasn’t seen that much playing time and I think he is 23 now.